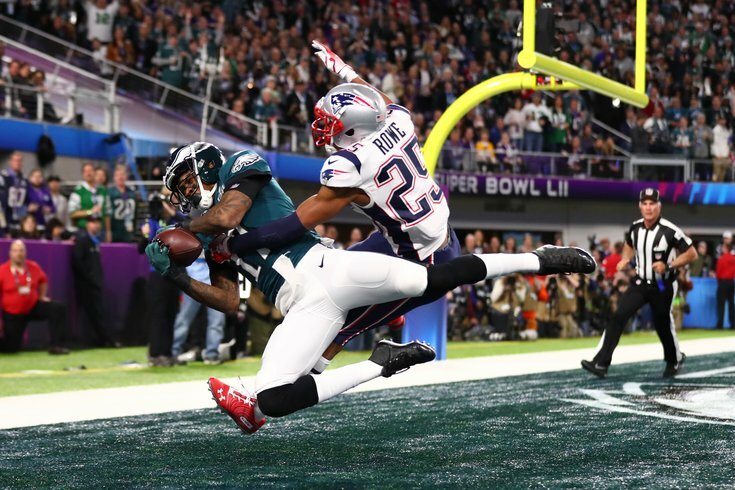 Philadelphia Eagles wide receiver Alshon Jeffery catches a touchdown pass over New England Patriots cornerback Eric Rowe in the first quarter in Super Bowl LII at U.S. Bank Stadium. After two long weeks of waiting for the Philadelphia Eagles to play in their first title game since 2005, Super Bowl LII is finally here. Like they did the last time they made it this far, the Eagles will square off against the New England Patriots. In order for the Eagles to earn their first-ever Super Bowl victory, they will have to get past Bill Belichick and Tom Brady, who are considered by many to be the best head coach and quarterback, respectively, in NFL history. When the Patriots have the ball, the Eagles will have to find an answer for star tight end Rob Gronkowski, speed demon wide receiver Brandin Cooks, and a trio of quality pass-catching running backs. When the Eagles have the ball, they will have a number of matchup advantages, most notably in the run game. The Patriots also don't seem to match up favorably against Zach Ertz at tight end or Nelson Agholor in the slot. The Eagles should be able to put points on the board against a flawed Pats D.
The Eagles have weathered devastating injuries all season long, most notably to Carson Wentz, Jason Peters, Jordan Hicks, and Darren Sproles. However, their current injury report blank. The Patriots, meanwhile, suffered a number of season-ending injuries earlier this year as well, though not to the extreme that the Eagles did. Here's the full Eagles-Patriots injury report, with analysis. It may have been noted a few times over the last month that the Eagles have been underdogs for each of their playoff games, to date. There was something about dog masks, I think. Has anyone read that? Well anyway, the Eagles are underdogs once again, as the Pats have been favored anywhere between 4.5 and 5.5 points. Here's a roundup of local, national, and Boston-based picks. I see an Eagles win. The Patriots' "favorite" status is more about their mystique than their current talent. This Eagles team is better, I think they know it, and they're not intimidated in the slightest. They're better in the trenches, they're far better on defense, and these two offenses, on the whole, really aren't that far apart. We'll see if they can win one last game soon enough.